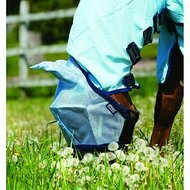 The Amigo Fine Mesh fly mask is made of a fine mesh fabric with a fleece border. The mask is lightweight, contains stretch material and has a preformed fit. The ears are large and of soft material. Now available in the new color silver / blue. 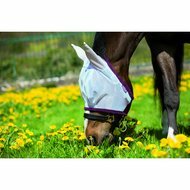 Nice fly mask, stays in place and is easy to put on. This flymaster in size COB is larger than many other mask in size FULL! For my PRE she was therefore not suitable at all. The material is soft and fine and feels good. Too bad they did not fit at all.